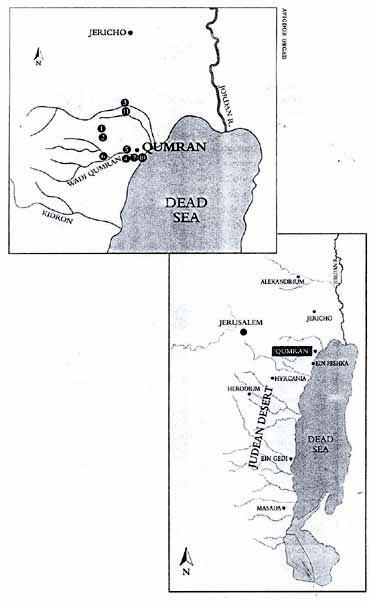 From eleven caves clustered around Qumran, archaeologists and Bedouin recovered the Dead Sea Scrolls. The caves are numbered in the order in which they were discovered. Qumran perches on a marl terrace on the northern edge of the Wadi Qumran at the base of high limestone cliffs. The site overlooks the Dead Sea thirteen miles east of Jerusalem. From The Mystery and Meaning of the Dead Sea Scrolls by Hershel Shanks.